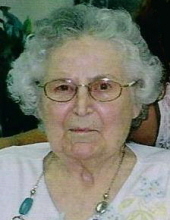 Luella Mary (Fouth) Shackelford, 88, of Mendota, formerly of LaMoille, passed away Tuesday morning, January 29, 2019 at the Mendota Lutheran Home. Funeral services will be 10 a.m. Saturday, February 2, 2019 at the Mueller Funeral Home, Peru with Pastor Kevin Weeks of the Zion Evangelical Lutheran Church, Clarion officiating. Burial will follow in Peru City Cemetery. Visitation will be from 9 a.m. to 10 a.m. Saturday at the funeral home. Luella was born July 2, 1930 in People’s Hospital, Peru to Arthur William and Rose (Hahn) Fouth. She attended Park Grade School, a one room country school, and graduated as valedictorian from LaMoille High School. She married Ronald Shackelford Sr. on April 28, 1968 and has three step-children. She was active in her church, The Church of Jesus Christ of Latter Day Saints. Luella lived in Sandpoint, Idaho for some time and enjoyed that scenic area. She was employed there in a sporting goods store. She returned home to Illinois to be the caregiver for her aging parents until her father’s passing in November 2000 and her mother in April 2001. Luella worked at various jobs in Princeton, assisting a chiropractic doctor, in a clothing store and a drug store. After a fall limited her mobility, she and her sister, Adella, lived together in LaMoille until April 2016 when she entered the Mendota Lutheran Home. She is survived by her step-children, Carollyn Shackelford of Henderson, NV, Ronald (Dorothy) Shackelford Jr. of Tacoma, WA and Laurie Shackelford of Yelm, WA; one sister, Adella Timm of Mendota; nieces and nephews, Ron (Melissa) Fetzer of rural Arlington, Julie (Bruce) Barganz of Mukwonago, WI, Brenda Dye of Malden, Theresa (Kiedock) Kim of Biggs, CA, Paula Henkel Pinter of West Brooklyn, Cynthia Daley of Oroville, CA, Beth (John) Donahue of Huntington Beach, CA, Brian (Melissa) Sondgeroth of Las Vegas, NV and Ben (Bethany) Sondgeroth of Sublette; step-grandchildren; great nieces and nephews and great-great nieces and nephews. She was preceded in death by her parents; two sisters, Corrine Fetzer on September 22, 2015 and Norma Sondgeroth on July 25, 2018 and three brothers-in-law, Robert Timm, Merle Fetzer and Eugene Sondgeroth. Memorial contributions may be directed to the Mendota Lutheran Home or to the donor’s choice. To send flowers or a remembrance gift to the family of Luella Mary Shackelford, please visit our Tribute Store. "Email Address" would like to share the life celebration of Luella Mary Shackelford. Click on the "link" to go to share a favorite memory or leave a condolence message for the family.